It was 2009 when I came across CNN iReport asking people to ‘tell their stories and discuss the issues that are important to them’. This was the first time I was introduced to the concept of a brand prompting its users to create content for them. Whether the brand would use the content and how they would use it, however, was completely up to them. But, there I was, ready to share my perspective in form of pictures and stories. We’ve come a long way from a non-interactive one-way communication approach adopted by brands to connect with their audiences. It’s been a heavy shift to make – from brands dictating trends through traditional platforms like press releases and print advertisements – all the way to brands encouraging customers to create content that they can leverage for their own brand authenticity. This significant shift from brands creating an unattainable ‘aspirational imagery’ to be more approachable has everything to do with how important it is to have substantial customer conversations today. Better yet, brands need a purpose and a consumer-focused strategy to fix an identified issue – whatever that may be. How is this being achieved? With the help of User-Generated Content. Once brands started moving towards a two-way communication strategy with their customers, the quality of customer lifecycle and loyalty to the brand has been given way more emphasis. It’s all about consumer behaviour. Brands don’t spend thousands of dollars or even millions just to get that one transaction. Today, brands focus on the customer’s post-purchase journey. Having spent the last few years monitoring the world of marketing, a three-way conversation is on the rise. Its been proven that two-way conversations are a fantastic way to engage with customers since it results in ‘highly personable and almost natural interactions’ with the brand. Now, brands are beginning to use this conversational approach integrated with UGC to further attract potential customers. A brand that instantly comes to mind is Rihanna’s Fenty that launched a couple months after Kim Kardashian brands made headlines in 2017. Note that Fenty Beauty is currently on all social media giants: Twitter, Facebook, Instagram and YouTube. Simply put, Fenty Beauty’s use of UGC projects authenticity and has led a to higher engagement rate when compared to its tough competitors. Not only is its content strategy on point with a clear message that resonates with a lot of people – a cosmetic line for ‘any culture, any skin tone, any race, any religion, anybody can wear it’ – its strategic use of UGC (with a super glam exclusive hashtag #rihgram) gives new life to the brand’s overarching message. No wonder, Rihanna’s Fenty Beauty has earned even more attention on social media than giants like Kylie Cosmetics and Kim Kardashian’s KKW Beauty. Leveraging fan-made content – essentially word-of-mouth in this day and age – and strategically customizing it with the knowledge of content strategy, brands can reach their full potential to not only establish loyalty in customers, but also reach new customers. It takes customers a few minutes to give feedback on products they use, and brands are recognizing this. Chief marketing officer at Foreo, a company that makes beauty devices adds that “brands now build a following based on reviews and comments”. In fact, recent research reveals that customers who engage with UGC are more than twice as likely to make a purchase than their peers. It’s not just cosmetic brands, a major reason for the fast expansion of K-pop’s fandom is because of how Korean agencies have repurposed fan-made content like compilation videos, vlogs, fancams and reactions to create a sense of anticipation, competition and needless to say, engagement among its fans. Today, how brands want customers to engage with them is changing. Brands of all sizes are experimenting with the way they want to create and use three-way conversations by integrating it with their marketing campaigns – all to reach their potential stakeholders. I didn’t ask Alexa who Scott Galloway was, but I did happen to Google him because our persistent professors at the University of Melbourne kept mentioning how he’s the ultimate marketing guru. With my last semester almost out of the way, I took the opportunity to use time spent on my commute to read Scott Galloway’s The Four. In the current fast-paced media environment, organizations need to adapt and learn how to timely respond to media hype. Many communities, corporations and nations choose silence in times of crisis. Theorists have attempted to analyse the undertone of using silence or the absence of communication with the media. Sellnow, Ulmer, and Snider (1998) argue that organizations refrain from any communication because of the possibility that it may be used against them in court. Regardless, Coombs (2012) argues that silence conveys ‘uncertainty’ and allows others to ‘take control’, further suggesting that the organization is ‘not in control’. In fact, Richards (1998) mentions that silence indicates the organization may be guilty or might have something to hide. The Volkswagen case on emissions standards is an apt example where the California Air Resources Board and the U.S. Environmental Protection Agency exposed the company for illegally installing software in its cars to dodge standards for reducing pollution (Pandelaere, et al., Companies Fare Worse When the Press Exposes Their Problems Before They Do). It was found that the CEO, Michael Horn, was tight-lipped about this ordeal even though he was notified a year earlier. Additionally, Volkswagen kept their silence even when EPA gave them a chance to come clean. As a result, the company faced negative publicity as this ‘information vacuum’ gave media a reason to suspect the organization and ‘build a case’ against it. To fill the information vacuum, it is of critical essence for the organisation to be proactive with its narrative. Heath (2004) elaborates on story guidelines: state an account of all elements (like characters, location, audience) in the story; elaborate on the organization’s control over the situation; double check the story in terms of logic and evidence; test whether the story is, in fact, ‘verifiable’. If an organization can follow these guidelines and timely fill the information vacuum with its narrative, it stands a good chance to manage the crisis successfully. Giving an account of the recent United Airlines PR disaster, the response by the company CEO, Oscar Munoz was inefficient to say the least. It was an unprecedented unfortunate event where a passenger was forcedly removed from a boarded flight. This was filmed and viewed worldwide, costing the company not only long-term reputational damage but also a loss of millions in market share (Winston, Pepsi, United, and the Speed of Corporate Shame). As a response to this fiasco, Munoz’s first statement wasn’t aligned with the seriousness of the contents in the video. The elements in his story weren’t rightfully mentioned as he referred to forcibly removing a passenger as simply ‘reaccommodating customers’ (Image 1). To curb the damage caused by the crisis, it was vital for Munoz to fill the information vacuum with an earnest response. Not only was his response one day late (Sakzewski, United Airlines: What can we learn from company’s ‘breathtakingly bad’ crisis management? ), he was completely out of touch with the narrative and associated emotions of his stakeholders. While the video itself was ‘verifiable’ content, Munoz’s subsequent attempts at apologizing were evidently inadequate to pacify the crisis. 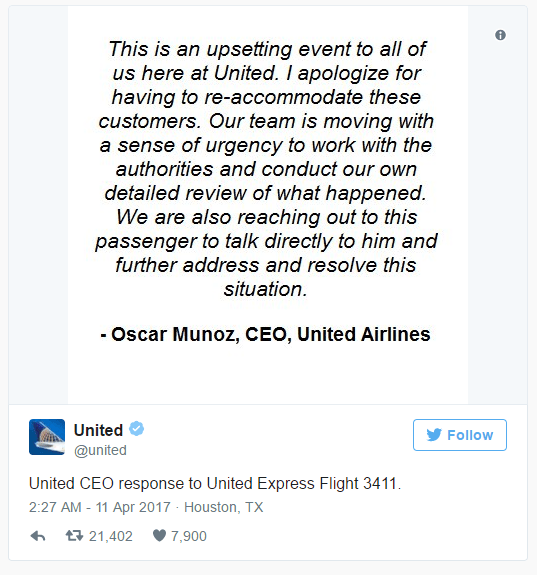 Eventually, his fourth statement via television mentioned that he felt ‘ashamed’, acknowledged that ‘no one should even be mistreated this way’ and apologized to the passenger (Anon., United Airlines will stop using police to remove passengers from full flights, CEO Oscar Munoz says). Munoz’s final apology was cohesive and aligned to Heath’s guidelines for a proactive narrative. 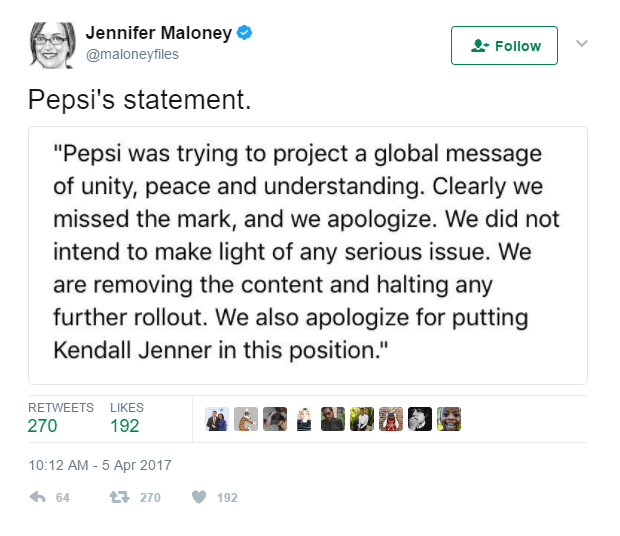 In contrast, when crisis hit Pepsi for its advertisement where Kendell Jenner is seen skipping a photo shoot to join a protest, the organization was quick to fill the information vacuum. After it received huge backlash for incorporating imagery from a Black Lives Matter protest and portraying protests as a fun event rather than a serious gathering, the advertisement was taken down immediately (Taylor, Pepsi’s new ad shows Kendall Jenner joining a protest and giving a cop a soda — and people are furious). Responding to the negative reactions, the company released a statement where they stated they wanted to convey the message of ‘unity, peace and understanding. The statement (Image 2) went on to acknowledge their mistake by stating: ‘clearly we missed the mark and we apologise. We did not intend to make light of any serious issue’. Pepsi followed through Heath’s guidelines as it had a proactive narrative, quick apology and took ownership for their tone-deaf campaign. To approach crisis management on social media, Cheng’s article examines crisis communication strategies and describes an Interactive Crisis Communication (ICC) model which focuses on the importance of measuring stakeholders at a time of crisis and strongly suggests building a long-time positive dialogue between the organization and stakeholders through a reliable third party. The ICC model mentions numerous strategies across different stages of crisis out of which ‘stealing thunder’ has noticeably proved successful in mitigating crisis. Claeys, Cauberghe and Pandelaere (2016) reveal findings from their research on ‘stealing thunder’ which involves disclosing the crisis before the media does. Studies show that when an organization discloses its crisis, not only is it identified as a more credible firm, the problems disclosed are also perceived as less severe. Additionally, another study confirms that people pay less attention to self-disclosing news from an organizational crisis due to its nature of being perceived as old news (Pandelaere, et al., Companies Fare Worse When the Press Exposes Their Problems Before They Do). 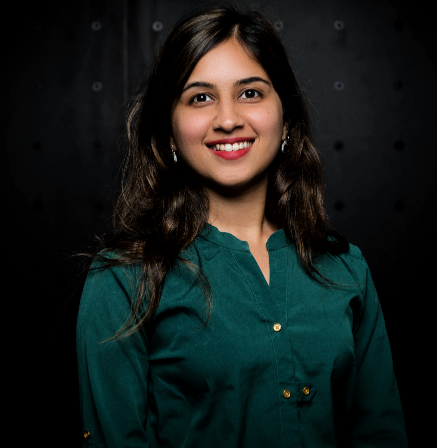 While it might be tempting for organizations to hide a crisis from their most important stakeholders – the public, dealing with the situation upfront, self-disclosing crisis details, ultimately stealing thunder can prove to be a sensible option because it evades negative attention and reputational damage to the company. Another successful practice for crisis management is choosing the right channel to target the right stakeholders. For example, Domino’s 2009 YouTube crisis involved responding to a fraudulent video published on the same platform. First, to respond to the crisis, Domino’s choice of platform (YouTube) was apt as this approach entailed a direct relationship with its targeted audience; second, the company could communicate through visually-rich content in place of a traditional press release waiting to get picked up by news reporters. Managing crisis through the right channel proved to be fast, engaging and effective for Dominos. After relevant research and a deeper look into the case studies mentioned, it is clear that crisis communication is more important than ever before much due to the increasing need for ‘immediacy’ in communication with stakeholders. Best practices for crisis management on social media include identifying evolving crisis and timely filling the information vacuum with a logical narrative. It is essential for organizations to understand the implications of keeping silent during crisis and steal thunder by self-disclosing crisis details through the right platform. In conclusion, organizations worldwide are functioning in a space where stakeholders can point out and magnify any errors made. There is a dire need for organizations of every size to comprehend the importance to regularly monitor the media in order to pacify any evolving negative PR story – called crisis creep (Regester and Larkin, 1997). Scholars agree that being upfront about the situation in times of crisis and investing in transparent conversations with stakeholders ultimately helps limit fake stories and negative publicity surrounding the company (Carmichael, Putting the Right Information on Twitter in a Crisis). Since crisis management in the digital age is still an evolving territory, we are bound to learn more about dealing with information vacuum in the near future.